It was an honour to attend the Belfast Historical Society Fundraising Dinner last evening at St. Andrew’s United Church in Vernon Bridge. They mentioned that the Belfast area at one time included what is now Vernon Bridge all the way down to Wood Islands. Belfast Historical Society Member Audrey Shillabeer offered an introduction to the Society’s work over the past 40 years before presenting this year’s Selkirk Award. The delicious dinner was prepared by Steven & Jennifer Taran and Kim Doherty-Smith & Ken Smith along with their team of volunteers. Following the dinner, they raised some extra money with a cake auction. The auctioneer was entertaining and had a knack for loosening the purse strings of a room full of Scots. The final cake, a fruit cake prepared by Donald MacDonald went for $201! Apparently, it was made with brandy which helped to launch the bidding. The mandate of the Belfast Historical Society (BHS) is to preserve, protect, and promote the history, heritage, and culture of the larger Belfast area. Our Society came into existence in 1976, and is 40 years old this year. Happy birthday to us! At a 1978 BHS general meeting, then President Mary Ross first suggested the Society establish special awards to recognize adults who contributed to our Belfast community. This award, the Selkirk Award, named for Thomas Douglas, the 5th Earl of Selkirk, would be given for a wide range of projects. It was determined that the Award would be given annually to individuals or groups in recognition of excellence for projects undertaken about the history of the Belfast district, or for outstanding contribution to preserving the heritage of the Belfast area. Lord Selkirk brought 800 Scots from the Hebrides to our area over 200 years ago beginning in 1803. His settlement was conceived as a “model village” designed to address the real and serious issues of the day. For his designed community, he recruited emigrants with wherewithal and with some means— “a very fine class of immigrants,” they’ve since been called. Belfast was the first and only truly successful Selkirk settlement — the others coming within a decade in Ontario and then Manitoba. Selkirk is said to have set “the enduring Scottish culture on Prince Edward Island” and many in this room likely trace their ancestry back to these early Scots. The Scottish-Canadian culture here in Belfast is as deep as your DNA. Matrilineal and patrilineal threads first spun in the old country are dyed deep in this unique community fabric. Many in this room work tirelessly for the memory of their ancestors and assure that the stories move along into the future, including tonight’s Selkirk Award Winners. 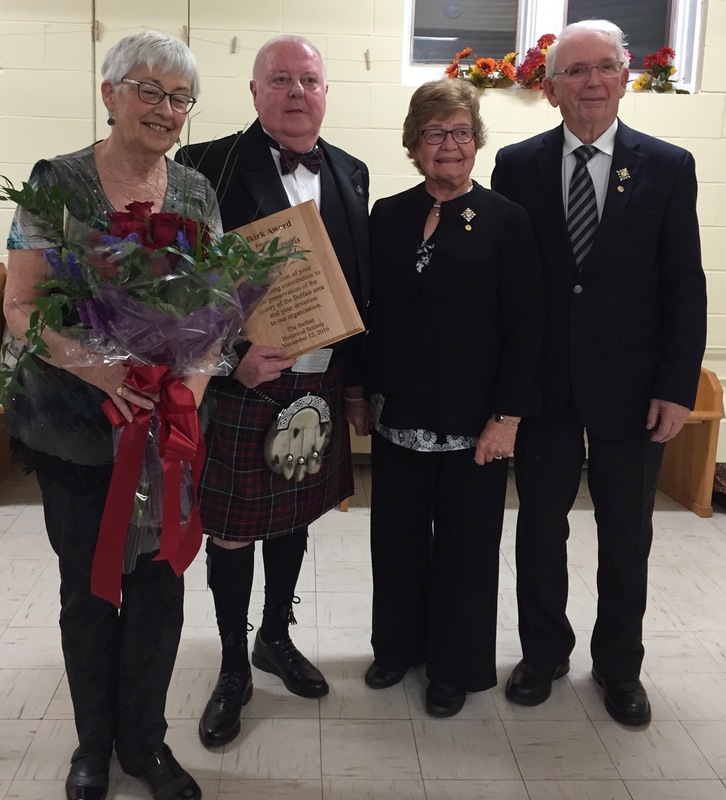 In our 40th birthday year, the 2016 Selkirk Award is given tonight to two of our historical society’s own — Donald and Doris MacDonald. Over the last ten years that I have known them, I have come to think of Donald and Doris as the “Keepers” of our historical society and, more importantly, of perpetuating our stories. Keepers are people who manage or look after something valuable, and in some cases, something fragile were there not people to attend to it. Keepers are trusted to ensure the continuity of something. Celebrating keeps us together. Events such as Scottish dinners, Polly Days, Tartan Days, Christmas fairs and such gatherings happen here in large part because Donald and Doris know them to be important. Music keeps community culture alive, and Donald and Doris are the best at conceiving, planning and executing the events that bring —and keep — us together: ceilidhs and concerts in the Gaelic tradition. If food keeps us together, the MacDonalds have baked enough cookies, biscuits, blueberry cakes, Christmas cakes; made enough soups, chowders, and stews; scooped enough ice cream and strawberries to assure our memories are tied to sated appetites and good company. And, much of what the MacDonalds do is not glamorous, yet they keep on doing what can only be seen as hard work. They have served as directors and officers in the Belfast Historical Society; kept up with our mandate to present educative guest speakers by first finding and then engaging them — not always an easy task! They’ve kept inventory straight, they’ve kept books and records, reported to associations, and to government agencies. They have completed grant applications, written letters, hired staff and supported them, attended partnering meetings throughout the province and so forth. Often with sleeves rolled up, they have even kept up the maintenance of the Croft House and its grounds. All of this is done with love, pride, dedication, charm, and sometimes — as the need arises— resurrected humour, the latter— on occasion — needing to be fortified by a smoothing toddy. Donald and Doris keep the vision, keep the faith, and keep our future bright! Please help me welcome Donald and Doris MacDonald to the microphone to receive their award. For your outstanding contribution to preserving our history, heritage and culture, I — with gratitude and joy — present to you the 2016 Selkirk Award. Congratulations, my friends. Editor’s Note: By 1807, Lord Selkirk had sold or granted for services 16,222 acres of his holdings to over 150 individuals on Lots 31 (which included Clyde River), 57, 58, 60, 62 and 53 — over half of that total on Lots 57 and 58. To learn more about Lord Selkirk and his Settlement, please link to this interesting article written by J.M. Bumsted for Island Magazine.